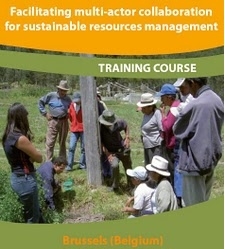 The training course is focused on the social process knowledge and skills to facilitate multi-actor collaboration. Multi-actor collaboration is a promising approach to face complex problems with multiple interdependent actors. The application is situated in local and regional initiatives related to sustainable resources management, like irrigation and drinking water, nature conservation, catchment management, mining conflicts, forestation, etc. The course is based on the principles of experiential learning. We invite participants to use their own experiences with multi-actor collaborative initiatives as an input for the course. The course starts with a multi-actor simulation to provide shared experiences on which we can reflect and build during the following course days. All sessions will be highly interactive. We invite particpants from North and South. There are fellowships available for participants from developing countries, funded by VLIR-UOS. The fellowships include tuition fee, travel and accommodation. Cycloop is een netwerk voor facilitatie en actie-onderzoek in multi-actor-samenwerking, met als drijvende krachten Koen Sips, Marc Craps, Johan Hovelynck en Art Dewulf. Cycloop is actief in vormen van samenwerken waar diverse actoren zoals overheden, bedrijven, n.g.o’s, experts, burgers en belangengroepen, complexe problematieken op een innovatieve manier aanpakken. Voorbeelden zijn overstromingsbeheer, afvalbeleid of stadsontwikkeling. Centrale thema's in het werk van Cycloop zijn duurzaamheid, diversiteit, netwerkorganisaties, sociaal leren, sturing, innovatie en systeeminterventies. De specifieke aandacht gaat uit naar het proces, de dynamieken en de relationele kwaliteiten van afstemming tussen verschillende actoren. Voor meer informatie over Cycloop klik hier. For more information about Cycloop click here.